1-on-1 zig-zag on each side, stay between the sideline and elbows extended, everyone goes down, repeat coming back. Go about 50% on offence, the defender turns the attacker fullcourt (make him change direction). The attacker goes 90-100%, how many times can the defender turn him. See Pressing - Billy Tubbs. 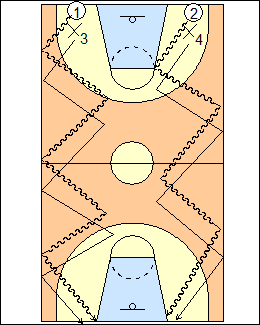 Start from both ends, zig-zag to halfcourt (how many times can you turn the attacker) then live 1-on-1 in the frontcourt using 2/3 of the court (from the sideline to the far elbow extended). The defender tries to keep the attacker on one side. Chris Oliver - he doesn’t like the zig-zag drill, defenders covering a dribbler in the fullcourt rarely slide in such a controlled way, they are constantly running and recovering (crossover step, sprint, jump turn to get back to a chest-to-chest position). 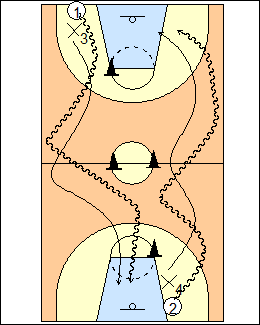 His suggestion is skip the zig-zag drill and run a fullcourt one-on-one drill, the defender tries to keep the ball in front, stay chest-to-chest, and turn the dribbler as often as possible; the dribbler should attack fast in a straight line and use change of pace (stop and go) to create space (if a second defender comes up in a game, invite a double-team by using a pull-back dribble to pull both defenders towards you, creating space and a potential pass or dribble out). Drew Hanlen - offensive goal is maximum backcourt "breaks" (separation from defender's hand), pass to coach at halfcourt for return pass, play 1-on-1, dribbles equal to number of breaks, defence can steal or deflect the passes. Progression - live fullcourt, see 1 on 1 - Spurs fullcourt, also Defending - Zig-zag, Slide and run, Pressing - Pasquali.